It is rare that I return to place I visited even if I loved it, but after first visiting Swell in October 2016 there was no question as to whether I would return. I didn’t just have a great vacation and improved on my surfing, but I also found a second home in the DR- so I returned at the end of April 2017 and after being home one week I am already planning my next trip back. The staff is amazing, friendly and helpful. 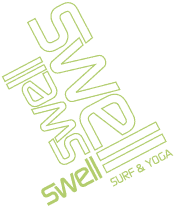 When you arrive at Swell, plan on feeling welcomed from the start with Houdy, the manager showing you around the camp and introducing you to the surf instructions, staff, and other guests and from there you are part of this wonderful family. Since, the place is so engaging the guests cannot help but also engage with each other and the “Swell Surf Family” is born. After the 7am daily surf lesson, the best part, after catching some waves, is you come back “home” to enjoy a beautifully prepared breakfast from the chefs. The large communal table fosters an engaging meal with your instructions and other guests, Also, there is a family dinners 4x’s a week and more friendships are made. With your new friends and family you also can enjoy the beautiful grounds and pool, yoga, day-trips, some crazy nights out…and most importantly some unforgettable memories. Swell is perfectly situated in Cabarete and a stone’s throw to Gordito’s – my personal favorite restaurant. The food will get you there but the Sangria and smiles is what keeps me going back. It’s my own personal mission to bring every new guest there for a Sangria or Margarita. Swell is also located within a short walking distance to beautiful beaches, shopping, and great nightlife.